Please note that this document does not work with a Mac computer. 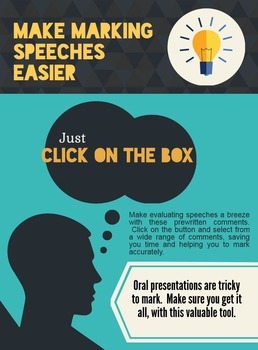 This document has been created to help teachers evaluate students during the speech evaluation. It is created in a Microsoft Word document so that you can easily modify it to suit your particular classroom needs. (You also have the option to copy and paste the entire page, or certain elements.) The document is completely modifiable, even the comments. The “grunt work” has been done for you. This quickens the evaluation process and will help the teacher to write down information more quickly. This particular document has been embedded with drop down boxes with comments on: elements of persuasion and argumentation, communication, the quality of information, the quality of sources, and the quality of visual aids. Please see the preview for a better idea of how this product can help you to assess your students.It’s teaching made easy!